It can be hard to maintain mental wellness as a law student because of established stigmas and a lack of available resources. We talk about how students are working on changing this. It can be hard to maintain mental wellness as a law student because of established stigmas and a lack of available resources. But, because wellness helps with success, students are taking action to change how law schools approach this subject. In this episode of the ABA Law Student Podcast, host Caitlin Peterson talks to Alexandria Gilbert, Nick DeFiesta, and Caroline Phillips about how the topic of mental health is addressed at law school. Their conversation includes how they are collaborating with their schools to bring attention to the issue and how other schools, divisions, and firms can help get the word out. Alexandria Gilbert is a third-year student pursuing a joint degree at Stanford’s Law School and Graduate School of Education. Nick DeFiesta is currently a joint degree student working toward a JD from Stanford Law School and an MPA from the Woodrow Wilson School, expected 2020. Caroline Phillips is a juris doctor candidate at American University Washington College of Law, expected 2020. 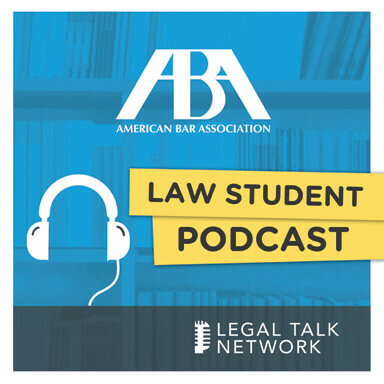 Presented by the American Bar Association's Law Student Division, the ABA Law Student Podcast covers issues that affect law students and recent grads. Terry Harrell and John Berry talk about mental health and well-being in the legal profession and law schools. Kennedy LeJeune, Miosotti Tenecora, and De'Jonique Carter talk about the importance of developing cultural competency as a law student. Jerome Crawford and Tiffany Buckley-Norwoodt talk about how the legal profession can become more welcoming for attorneys of color. Shawnita Goosby, Crystal Taylor, and Meghan Matt talk about how they manage their lives as mothers in law school. Dr. Maria-Vittoria Carminati and Dr. Michael Foerster talk about the future of space and telecommunications law. Negeen Sadeghi-Movahed talks about law student life and her goals as chair.